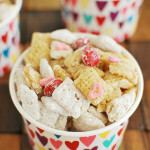 Cupid’s Crunch – the cutest Valentine’s Day treat! Chex cereal coated in white chocolate and peanut butter and tossed in powdered sugar. With Valentine’s Day M&Ms and heart sprinkles! I’m sure I tell y’all this every year but Valentine’s Day is my favorite holiday. I love any excuse to put hearts up in every room of my house. And this year is even more exciting for me because I finally have a kid in school which means I finally have an excuse to buy those cute little cards. I don’t even know if my kid’s class is exchanging Valentine’s cards but you better believe I bought some as soon as they appeared on the shelves of my store. Because, lord knows, the last thing I need is for Walmart to run out of Power Rangers cards. I also love any excuse to use heart sprinkles and this Cupid’s Crunch is perfect for that! It’s like your classic muddy buddie but uses white chocolate to coat the Chex instead of milk chocolate. There’s also peanut butter mixed into the white chocolate because, duh. Once the cereal is coated in the peanut butter and white chocolate, it’s tossed in powdered sugar. Then you stir in some Valentine’s Day colored M&Ms and heart sprinkles. It’s just the cutest little Valentine’s Day treat! How about my Red Velvet Brownies with Cream Cheese Frosting, these super cute Rolo Pretzel’s Valentine’s Day Candy, or these Valentine’s Day Cake Pops? Or if you want something for the grownups, how about my White Chocolate Mousse with Raspberry Sauce or Chocolate Chip Croissant Bread Pudding? Place cereal in medium bowl. In small microwavable bowl, microwave vanilla chips, peanut butter and butter uncovered on High 1 minute to 1 minute 30 seconds, stirring every 30 seconds, until melted and smooth. Pour peanut butter mixture over cereal, stirring until evenly coated. Place 1/2 of the cereal mixture in 1-gallon food-storage plastic bag. Add powdered sugar. Seal bag; shake until well coated. Spread on waxed paper or foil; cool about 15 minutes. Meanwhile, stir candies and sprinkles into remaining cereal mixture. Spread on waxed paper or foil; cool about 15 minutes. In serving bowl, mix both cereal mixtures. Store in airtight container. 13 Responses to "Cupid’s Crunch"
Sounds dangerous for snacking, I’d probably eat the entire batch :) love white chocolate! Those adorable little treat cups popped into my cart the other day at Target too! 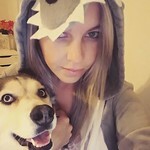 Gah they are so cute I can hardly stand it! Just by looking at your pictures I can tell that this would be MAJORLY addictive stuff! Great recipe! I’ll eat the whole bowl. K thanks! I dont believe in going out for dinner either on Valentines day. A home cooked meal is such more intimate. 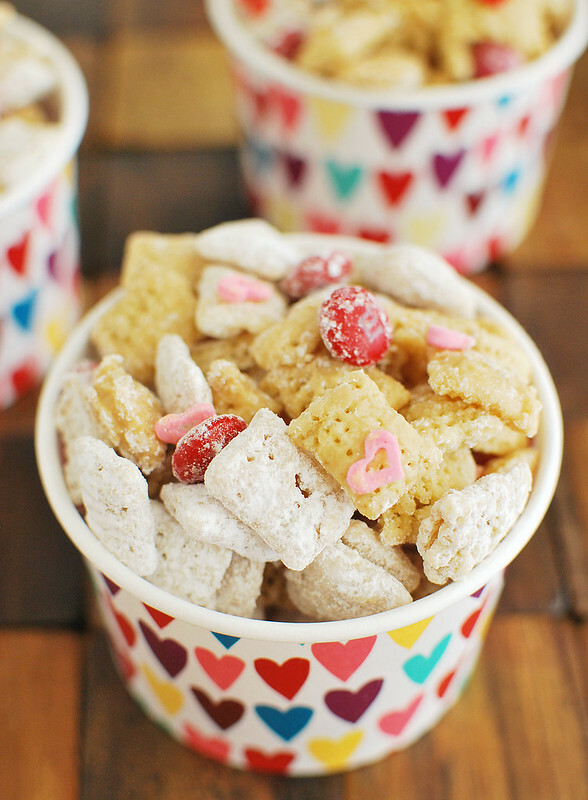 And this puppy chow looks perfect for the national holiday of love! Awwww, I love V-Day too – glad I’m not the only one! I don’t know why I still haven’t made muddy buddies yet but I’m thinking this is the perfect version for me. I adore white chocolate! I want to reach through the computer screen and eat that whole bowl! yum! I love white chocolate and peanut butter together! the name of this recipe just makes me giggle – haha i love it! i would eat way too many bowls of this. sooo good! I bet that’s just a wee bit addictive. Love it! I am a big fan of white chocolate too! 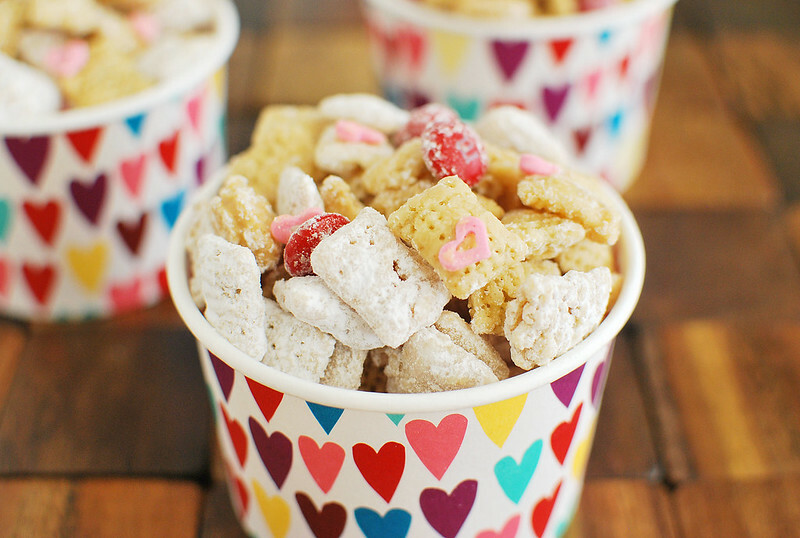 My boyfriend loves puppy chow- going to make this for him this weekend! This is such a cute idea and I love the name! It also looks delicious and a special treat that would be hard to put down :) Thanks so much for sharing on Something to Talk About! What a cute and simple treat!